Switching from lead shot can help save birds! Waterfowl must swallow hard particles so their gizzards can grind up hard foods, like grains. Unfortunately, they can't tell a lead pellet from a small pebble. Beginning in 1991, waterfowl hunters were required to switch from lead shotgun pellets to pellets made of non-toxic metals. The switch to non-toxic shot has made a positive difference for waterfowl, like this Trumpeter Swan. Where does your state stand? Check Related Resources to find out! 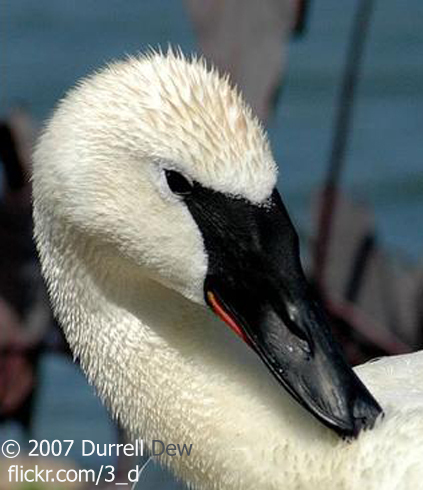 You can also learn more about the Northwest Swan Conservation Society and The Trumpeter Swan Society. But one important feature of that hunting tradition has changed. Beginning in 1991, waterfowl hunters were required to switch from lead shotgun pellets to pellets made of non-toxic metals. In the past, foraging ducks, geese, and swans often ingested lead shot that had fallen to the ground. Waterfowl must swallow hard particles so their gizzards can grind up hard foods, like grains. Unfortunately, they can’t tell a lead pellet from a small pebble. [Male Mallards] Even two pellets of lead in a duck’s digestive system can cause a slow death from the effects of lead poisoning. Many birds were affected. The switch to non-toxic shot has made a positive difference for waterfowl. [Male Mallards] But lead shot is still widely used for the hunting of gamebirds like pheasants, which often share areas used by waterfowl. Learn more at BirdNote.org. I’m Mary McCann. * In addition to the federal regulations, many states have enacted legislation banning lead shot for upland bird hunting. As of 2010, 23 states have bans on toxic shot past the federal waterfowl regulations. Two of the largest pheasant-hunting states, South Dakota and Nebraska, have banned lead shot on more than 400,000 acres. To check the laws in your area, visit the state links page in Related Resources. Bird audio provided by The Macaulay Library at the Cornell Lab of Ornithology, Ithaca, New York. Canada Goose calls recorded by W.W.H. Gunn. Trumpeter Swan calls recorded by J.M Hawthorne. Mallard calls recorded by A.A. Allen. State regulations on lead shot and more - Check it out!